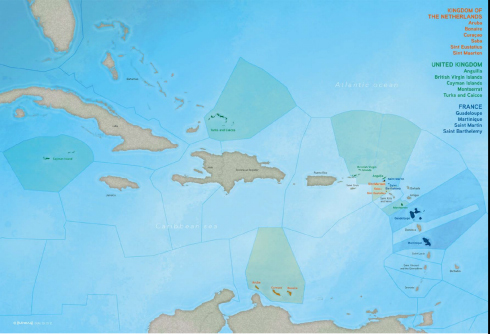 The European Union comprise 34 Outermost Regions (ORs) and Overseas Countries and Territories (OCTs) located in 7 regions and 3 oceans : Caribbean, Indian Ocean, Pacific, Macaronesia, Polar and Sub-polar, Amazon and South Atlantic. Those territories belong or are politically attached to six EU countries (Denmark, France, The Netherlands, Portugal, Spain, UK), even though they are in some cases geographically very distant from continental Europe. Those entities are very rich in biodiversity and natural resources. They host a high number of endemic species and are home to several Key Biodiversity Areas (KBAs), globally important for the biodiversity worldwide. This natural heritage is instrumental for the economic, social and cultural potential of the inhabitants of those entities. Serious threats are being faced by biodiversity there, such as the destruction of habitats, spreading of invasive alien species, or pollutions to the natural habitats. This, combined with their isolation and their insular nature (except for French Guyana), makes most of them very vulnerable, especially to the effects of climate change. For these reasons it is vital for the European Union to ensure the conservation and a sustainable use of biodiversity and ecosystem services in these overseas entities. Due to their particular political status, EU Overseas do not rely today on a sustainable and long-lasting funding european scheme to protect their biodiversity and natural resources on the long-term. The BEST initiative – which stands for Voluntary scheme for Biodiversity and Ecosystem Services in Territories of EU Overseas – has been launched in 2010 by the European Parliament to promote conservation and sustainable use of biodiversity and ecosystem services in EU ORs and OCTs. The first two years of the BEST preparatory action, BEST 2011 and BEST 2012, have been implemented through two open calls and have attracted 84 eligible proposals – with a total of 16 projects financed in the end plus 2 reserve list projects funded through the Agence française de Développement given their interest. The number, the high-level of demand and the quality of the projects’ proposals have clearly demonstrated the need for funding directed to projects aimed at protecting EU Overseas biodiversity. It was therefore decided that the funds available for the third and last year of the BEST preparatory action would be invested in ensuring the sustainability of the BEST scheme. This actual third and last year of the BEST Preparatory Action was implemented through an open call for tender launched in 2013. The successful tenderer is an international consortium of 10 partners led by IUCN, which mission is to carry out this work in all the regions of the EU overseas in close conjunction with key institutions involved in these topics, both at the local and national levels. 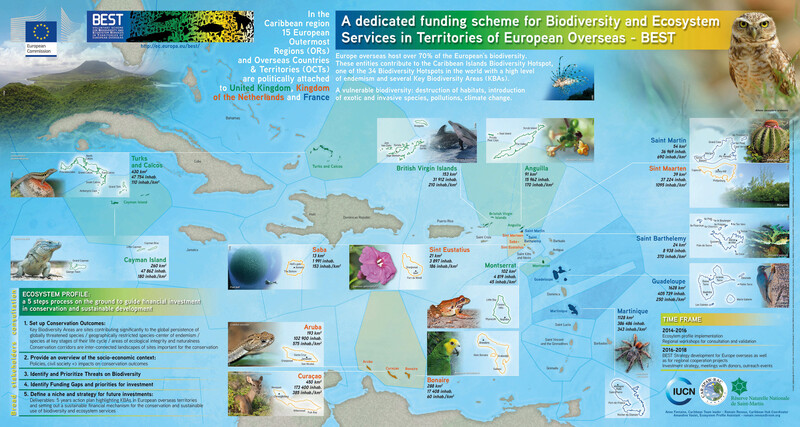 In the Caribbean Region, the SPAW RAC (Regional Activity Center for Specially Protected Areas and Wildlife) in partnership with the Natural Reserve of St Martin will be in charge of the coordination of the Caribbean regional hub and of the development of the Caribbean ecosystem profiles for the 15 European overseas entities in close partnership with the existing networks and stakeholders. contributing to the Caribbean BEST strategy where priority of actions and assessment of current investment in biodiversity will be identified in order to define niche for investment and establish a 5 years action plan to submit to the European Commission.